Why rent a car in Sardinia? Sardinia is a great place for renting a car. Having the freedom of your own wheels will let you explore the fun and historic cities like Alghero and Cagliari, visit impressive nature reserves or famous beach areas like Costa Smeralda, and even to venture further than most tourists go by traveling to island’s rugged and fascinating inland parts. Olbia Costa Smeralda Airport. A focus location for Air Italy and also served by a number of other airlines, this cozy little airport serves the city of Olbia and the wider Northeast Sardinia region. The airport is just 5 km (3 mi) from Olbia city center. Cagliari Elmas Airport. The busiest airport in Sardinia, located about 7 km (4.3 mi) from Cagliari downtown, serves around 3,5 million passengers every year. Alghero Airport: Although working year-round, Alghero Airport is especially active during the summer months when it provides a number of domestic connections, as well as flights to and from France, United Kingdom, Germany, and many other European countries. By sea: There a number of daily ferry routes from Sardinia to the Italian Mainland, although there are a lot less options during autumn and winter. It is possible to bring your rental car on a ferry, but ask your car rental provider in advance if they permit it. Cagliari. Like the rest of Sardinian cities, Cagliari tempts travelers with its world-class beaches, but the island’s capital also has plenty to offer in interesting museums, impressive churches, lovely squares, and hip art galleries. Alghero. Inhabited by Catalans and Spaniards since the 14th century, Alghero is sometimes referred to as Little Barcelona. History buffs love it for its cathedrals and fortresses, while diving enthusiasts never grow tired of exploring the nearby underwater caves and grottoes. Costa Smeralda. It might be busy, but that’s for a good reason - Costa Smeralda is considered by many to be the most beautiful stretch of coast in Italy (and one of the most attractive ones in the whole of Europe). Come here to make new friends, visit beachside restaurants, and enjoy the high life. Tharros. Corinthian columns and other remains of this town on the Western Coast of the island tell a lot about the long and interesting history of Sardinia. Its name comes from Greek, but throughout time it was also home to Romans, Phoenicians, and, even before that, to the mysterious Nuragic civilization. Asinara. The small island near the northwestern corner of Sardinia was closed to the wider public for almost a century and then turned into a national park 20 years ago. The long isolation created its most famous inhabitants - a population of albino donkeys. A fortress and a medieval monastery are also very much worth a visit. Sassari. 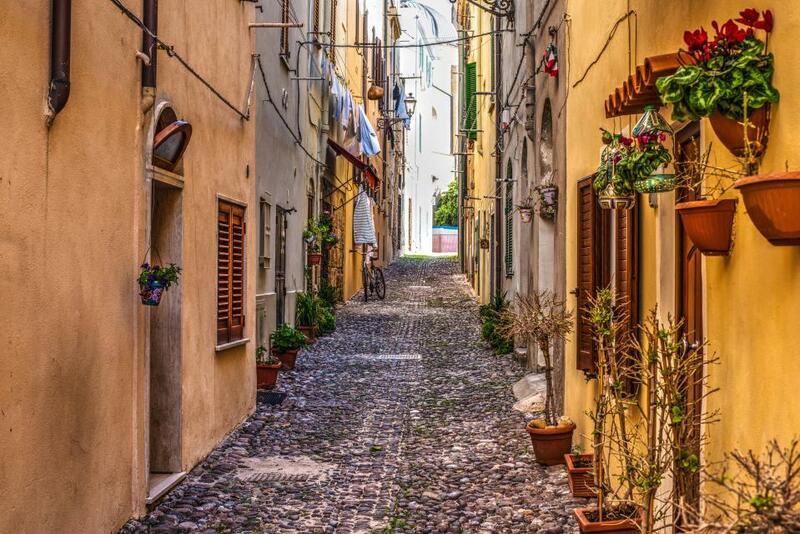 Home to just 130,000 inhabitants, Sardinia’s second city boasts such variety of amazing architecture that would make a much larger European metropolis proud. Walk its labyrinthine streets and spot different styles like baroque, neoclassical, and Catalan gothic. The most popular rental car in Sardinia is the Ford Fiesta, although travelers also love the Renault Clio and the VW Golf Metano. Italy accepts all driver licenses issued in the European Union (EU). If your driver license is issued by a non-EU country, for it to be considered valid you’ll need an Italian visa. Another requirement is to have been in the EU for no more than six months at the time of the rental. If you’ve been in the EU longer, you’ll need a driver license issued by an EU country. If your driver license is printed in a non-Latin alphabet (Cyrillic, Arabic, etc. ), you’ll need an International Driving Permit (IDP) or an official translation of your license into English or, preferably, Italian. You must carry your driver license, not its copy, with you at all times. You need to have had your driver license for at least one or two years, depending on the car provider’s requirements. There may be additional requirements depending on the car provider and car category, so make sure to check the terms and conditions before booking. The region of Sicily has no international borders. Mainland Italy is bordered by France, Switzerland, Austria, and Slovenia, as well as San Marino and the Vatican City, two enclaves inside it. Like Italy, France, Switzerland, Austria, and Slovenia are all members of the Schengen Area, meaning that three entry requirements for these four countries are the same as for Italy. The microstates of San Marino and Vatican City are not members of the Schengen Area, but their entry requirements are the same as those for Italy. Some car rental providers allow you to cross national borders and even drop off your car in a different country, while others don’t. If you’d like to cross a national border during your rental period, make sure to check the terms and conditions before booking a car. Learn more about cross-border rentals in our FAQ section. The most popular rental car type in Sardinia is an economy, closely followed by mini and intermediate. Sassari - Olbia (100 km / 60 mi) This drive takes around 90 minutes, but, should you choose the only slightly longer option through the town of Tempio Pausania, you’d get a chance to buy a bottle of the delicious Vermentino from its original makers, bath in the town’s thermal waters, or climb the nearby Mount Limbara that allows amazing views from its summit. Cagliari - Alghero (230 km / 143 mi) The route between the northwest and the southwest of the island (or vice versa) can be traveled in less than three hours, but if you’re not a rush, do use the opportunity to visit the fascinating Barumini Archeological Zone, a UNESCO World Heritage Site that’ll be on your way. Cagliari - Olbia (274 km / 170 mi) Bending through small inland towns, the route between two of the most important Sardinia’s cities can be traversed in just under three hours. Visit on the month when the rental prices are the cheapest. According to our data, visiting Sardinia is the cheapest in February when renting a car is about 40% cheaper than the yearly average. Which is the cheapest month to rent a car in Sardinia? The cost of renting a car in Sardinia depends on the time of year. This graph compares price changes from month to month in order to find the best offer. The cheapest month of the year to rent a car in Sardinia is March — prices start from $24.44 for an Economy class vehicle. This is 46% cheaper than the year’s average and 63% cheaper than renting a car in the month of November (when prices start at $65.23 for a Compact class). This information can help you identify the low season. But these are only average numbers. The exact price for your trip will depend on the length of your rental and the number of days until your rental period begins. Just enter your dates in the form at the top of the page to see exact prices and offers. What’s the average rental length in Sardinia? Average length differs from month to month. The longest rental periods are in January — an average of 12 days. The shortest are in October — an average of 5 days. What’s the most popular time for renting a car in Sardinia? Discover Car Hire users search a lot of locations daily. We gathered this information in order to analyze car rental popularity in Sardinia. The most popular month is July, while the least popular is October. Travelled the Island, definitely want to return!